WALL TOWNSHIP, N.J. -- A former professional hockey player who now coaches a high school team in New Jersey is accused of assaulting a player. Simple assault charges were filed against Jim Dowd over the incident, which allegedly occurred last Wednesday when his Manasquan/Point Pleasant Beach team played Red Bank Regional at the Jersey Shore Arena in Wall. The complaint alleged that Dowd, who played for 10 teams over 17 seasons in the NHL and suited up for the New Jersey Devils in two separate stints, kicked the 16-year-old student in the back during a game. Dowd was scheduled to appear in Wall Township Municipal Court on Tuesday, but he retained a lawyer who got the hearing postponed. 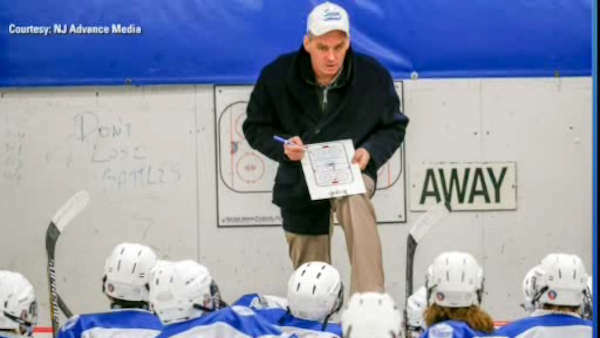 Dowd has agreed to step down as coach of the varsity hockey team during the investigation, with Manasquan School Superintendent Frank Kasyan saying it was best to relieve Dowd of his coaching duties in the interim. Sources say Dowd is taking the allegations very hard and that he treats his players as if they were his own children. "Jim Dowd is a member of the Manasquan School District, we support him as we would any staff member in an alleged act. Up until this point, he has done nothing but good for our school district. We are hoping for a speedy resolution to this unfortunate situation. We look forward to Coach Dowd being exonerated and returning to the 2015 hockey season." Dowd is best known to local hockey fans for scoring the winning goal in game 2 of the 1995 Stanley Cup Finals against the Detroit Red Wings.